CARAT The term carat refers to the weight of the gemstone, not the size. In jewelry, the size of a stone is measured in millimeters. Since diamonds can be cut from shallow to deep, it is impossible to convert a millimeter size into an accurate carat weight. 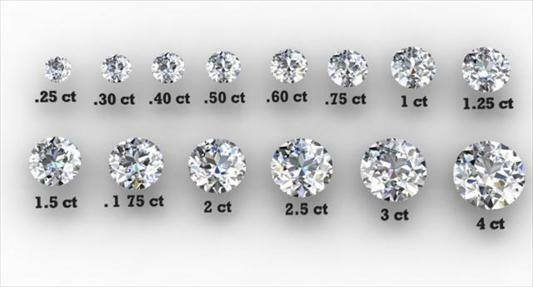 As an example, a diamond that is cut shallow will look bigger in size, looking at it from the top, than another diamond weighing the same, but having a deep cut. Jewelers may also refer to a diamond's carat weight as a number of "points". A carat is divided into 100 points. A quarter- carat diamond might be marked .25ct or 25 points. A one-half carat diamond might be marked .50ct or 50 points. The weight of the diamond has the most significant impact on its price. The higher the carat weight, the rarer it is, the more expensive it is. A mistake commonly made is to assume the price of a 2 carat diamond should be double the price of a 1 carat diamond. Because it is much more difficult to find and cut a 2 carat stone, the rarity factor comes into play and the price is significantly higher. COLOR Diamonds can be found naturally in every color of the rainbow, but the most common are those near colorless. Diamond color is ranked on a scale from D (colorless), to Z (natural yellow). The rarest and most expensive diamonds are either D-colorless, or of natural fancy color such as blue, yellow and pink. Not all colored diamonds are natural. Some are treated with harmless radiation to artificially enhance color. Irradiated blue diamonds are very common on the market today. A diamond's color should be graded when it is not set in a piece of jewelry, because the color of the metal the diamond is set in can play visual tricks on the human eye. A diamond set in yellow gold might make a diamond appear to be more yellow. On the flip side, a diamond set in white gold might make it appear to be more white or colorless. CLARITY Like the color scale, GIA’s clarity grading system developed because jewelers were using terms that were easily misinterpreted, such as "loupe clean," or "piqué." Today, even if you buy a diamond in another part of the world, the jeweler will likely use terms such as VVS1 or SI2. Clarity refers to the number of "inclusions", or flaws, that are found inside a diamond. Inclusions can detract from the way light reflects from a diamond, making it appear less brilliant and scintillating. It is extremely rare to find a diamond without inclusions; when one is found, it is ranked "flawless", is very costly, and is not typically sold in jewelry stores. Inclusions uniquely characterize diamonds and become like fingerprints because no two diamonds are alike. Feather: A separation or break that reaches the surface, and is often white and feathery or shiny in appearance. Pinpoint: A very small included crystal, normally seen under 10X magnification as a tiny dot. Carbon Spot: A black, brown or other dark colored dot inside the diamond. Cloud: A hazy or milky area made up of a number of very small inclusions grouped together. Size: The larger the inclusion, the lower the clarity grade. Number: The more inclusions within the diamond, the lower the clarity grade. Position: Inclusions in the center and toward the surface of the diamond affect the clarity negatively. Nature: Large feathers will affect a clarity grade more negatively than pinpoints, for example. Relief: Inclusions that are black, brown, dark red or green are easier to see, and so have a greater impact on the clarity grade of a diamond. CUT is the most complex of the 4 C's. It governs the interaction between a diamond and the light around it, and that interaction determines the diamond's overall appearance. When surrounding white light enters a diamond, one of two things will happen: it will continue to reflect off the inside surfaces of the diamond until it finally exists from the top (well cut), or it will exit the diamond right away through the side or the bottom (fair to poor cut). Some of the light that leaves the diamond through the top is bright white light, which adds to the diamond's brilliance. Other white light rays divide into colored flashes that are commonly called fire. These spectral colors of the rainbow are red, orange, yellow, green, blue and violet. When the diamond, the light source, or the wearer of the diamond moves, and the diamond catches the light around it, it sparkles with flashes of white and spectral-colored light. This sparkle is called scintillation. In short, the more brilliance, fire and scintillation a diamond shows, the better cut it is. The shape of a diamond also pertains to cut. The round diamond cut came in the 19th century and was referred in the beginning as the English Round Cut. The English round diamond introduced in the 19th century had roughly 58 facets, and todays round diamond have the same amount of facets. Although the round diamond has evolved, the same original round diamond cut is still recognized now as it was when it first came to be. Round diamonds have set the standard for all other diamond shapes, accounting for more than 75% of diamonds sold today. They are the most popular and traditional choice for all occasions and preferred by many for a diamond engagement ring. The oval diamond was created in the 1960′s by Lazare Kaplan and has a similar fire as the round or brilliant because it has a similar shape. The advantages of an oval over a round would be that it can appear larger because it is an elongated shape and it can also give your fingers a slimming effect. Oval Shape Diamonds are cut in a brilliant cut style similar to round diamonds and their technical name is oval modified brilliant. They also provide a bigger surface area than a round diamond with the same carat weight and therefore are an excellent option if you want the brilliance of a round diamond and also a bigger diamond for your dollar. An emerald diamond is rectangular in shape and instead of being sparkly has a mirrored look, which gives it a depth that other shapes don’t have. This is because of the step cuts that are used below the girdle of the stone. The emerald shaped diamond is considered an elegant diamond because of the dramatic flashes of light and will give your hand an elongated look. Emerald Cut Diamonds are step cut and they are usually rectangular in shape but sometimes may be square, in which case it is known as a square emerald cut. Emerald cut diamonds have rows of elongated facets on the crown and pavilion, known as steps, parallel to the girdle with corner facets. The number of rows of elongated facets may vary on an Emerald cut diamond, although it is usually three. A Trilliant shaped diamond are one of the more unusual cuts and are also known as Trillion or Trielle cut diamonds. The Trilliant cut diamond displays a very sharp brilliance and fire when it is cut to the correct depth which allows for excellent scintillation. Trilliant cut diamonds can often come with slightly curved sides that create a softer look than straight edge Trilliant cut diamonds. Henry Grossbard perfected the modern Radiant shape diamond in 1977. A radiant shape, which is really a cut, was the first square to be introduced, although the corners are cropped, and it is a hybrid of the asscher and the cushion. These diamonds can be longer, like the emerald and look good surrounded by all stones, which make them a good centerpiece stone for any ring, as they contain a lot of fire and brilliance. The radiant cut diamond was designed to have the best qualities of both round brilliant and emerald cut diamonds. An asscher diamond is similar to an emerald shape but it is a square shape. This shape was first cut in 1902 and has just recently gained popularity again. This shape has more brilliance than the emerald diamond and when you look through the center of the stone, it should appear to have concentric squares inside it. The asscher diamond has cropped corners, but because it is a square it looks more like an octagon. Because of its high crown and small table, the Asscher cut diamond has more light and fire than an Emerald cut diamond. Princess Cut Diamonds are square in shape and cut in a brilliant cut style square with uncut corners. Princess Cut Diamonds generally have 76 facets, making it an extremely brilliant diamond. They are the most popular non-round shape diamond. They have a beautiful brilliance and a modern square shape that accentuates a diamond's fire rather than its luster. Heart shapes are unique and are a modified round or brilliant shape. It’s important that the symmetry is even when selecting this type of diamond, and because it is not traditional, make sure it is something you would be happy with long term! But, hearts are the symbol of love and what better way to show your love than with a heart shaped diamond. Heart shaped diamonds are almost round in appearance and they provide a beautiful brilliance. 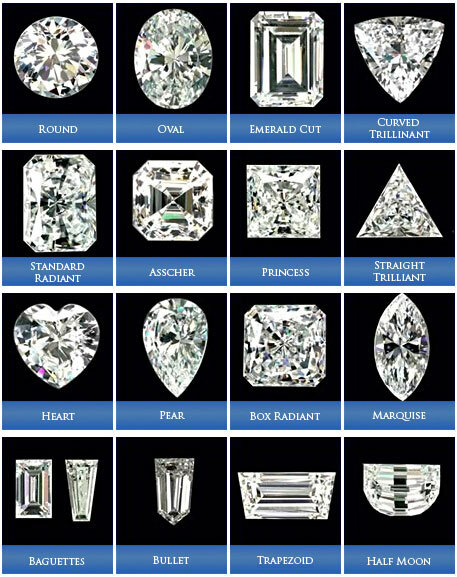 Most heart-shaped brilliants are purchased as single diamonds for solitaire necklaces in sizes of a half carat or engagement rings. The pear shaped diamond is a combination of a round, oval and marquise all rolled into one diamond and are often called Teardrop shape. The narrow pointed end is supposed to be worn facing the person who is wearing the ring and the elongated shape gives the illusion of a larger stone and longer fingers. A typical Pear shape diamond has 58 facets. Pear shape diamonds are popular for people who like the look of a round diamond but would like the style of a fancy shape diamond. Some of the world's largest and most famous diamonds are Pear Shaped Diamonds. When choosing Pear shape diamonds consider the color, because colors below J may appear to show more color in the corner areas. The Marquise Cut Diamonds have a boat like shaped girdle with 57 facets and they are brilliant cut. The Marquise Cut takes its name from a legend relating to the Marquise of Pompadour. According to the legend, the Sun King desired a stone to be polished into the shape of the mouth of the Marquise. The marquise has a very big surface area for the carat weight so is an excellent option if you want a bigger looking diamond, for fewer dollars. This shape has the largest crown, or flat top of any shape of diamond, so it really does give the illusion of being larger than it really is. A birthstone (or birthday stone) is a gemstone, usually in the form of personal jewelry and most often in the form of a ring. Each stone is traditionally associated with various qualities that symbolize the month of birth in the Gregorian calendar. 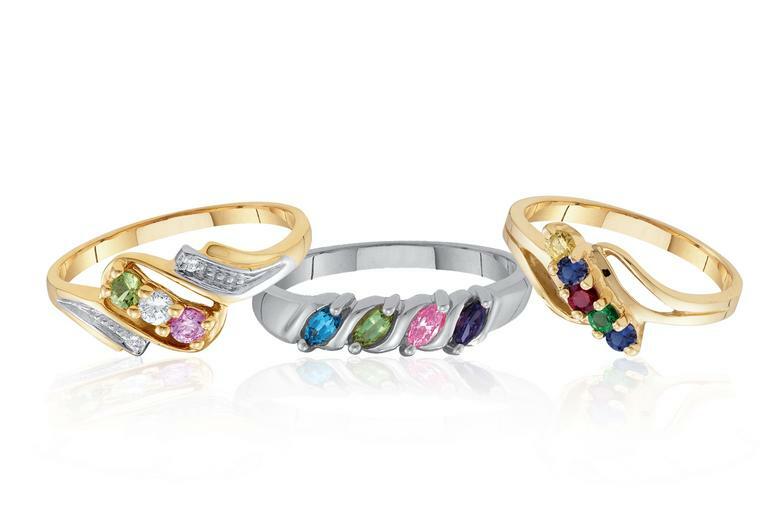 It started as two wedding bands joined together by the birthstones of the sons of a couple, which sold very well during the Mother's Day season as a present to your own mother or to your wife.The name "Mother's Ring" is trademarked since 1959 by jewelry company John C. Nordt Co. Standard birthstone rings feature the birthstone of the ring's wearer, but mother's rings include the birthstones of all of her children. In some cases the birthstones of the parents are also set in the ring. Some are also personalized with the names of family members, or the family name. Similar rings, often featuring the birthstones of both her children and grandchildren, are sometimes given to grandmothers as well. These rings are popular Mother's Day gifts, and are often given to a mother or grandmother upon the birth of a new child or grandchild, both as a new ring or to replace an old one. 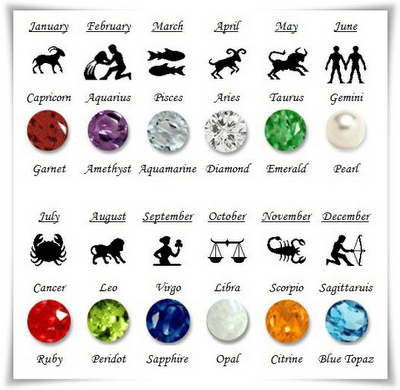 The Gregorian calendar has poems matching each month with its birthstone. Diamond Table Size - is the length of the table of a diamond located at the top in the crown of a round brilliant diamond. Girdle Thickness - is the thickness of the girdle, located at the side of the diamond where the upper girdle facets and lower girdle facets meet. Crown Height - the measurement from the girdle to the table of the diamond. 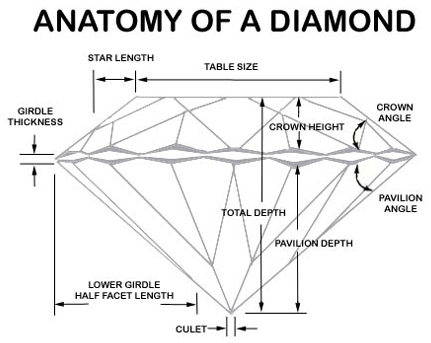 Pavilion Depth - the measurement from the girdle to the culet (bottom tip of the diamond) of the diamond. Crown Angle - is the angle of the crown relative to the girdle. Pavilion Angle - is the angle of the pavilion relative to the girdle. Culet - bottom tip of a diamond. Star Length - the length of the star facet located at the crown. Half Facet Length - length of the pavilion facet.